"I take my life experiences as a dancer and choreographer and meld them together in my art, constantly looking at the world with an openness to seeing different perspectives with focus and discipline." 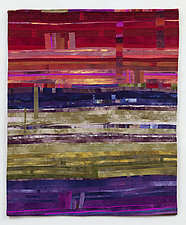 Beth Carney works in an improvisational manner exploring line, shape, color, and motion, creating a visual dance with fabric. 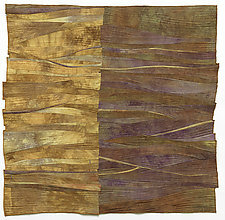 Her work revolves around the use of bold colors and textures to create pieces with a sense of rhythm and movement. Her abstract compositions are inspired by a constantly changing perception of the world around her while always connecting to her dance background. 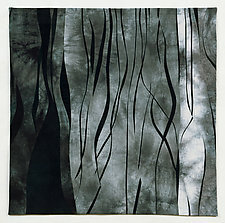 Carney dyes her own fabrics using different methods to create various patterns and textures. The thread work adds another layer of line and motion. Beth Carney's work explores the relationships between motifs, patterns, and the gestural lines that magnify what lies beneath the surface as well as what emerges from the chasms. With a bachelor of fine arts degree, Beth Carney has taught dance technique and composition since 1975. 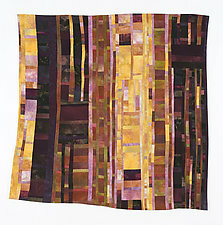 She started quilting in the early 1970's using traditional styles and techniques. 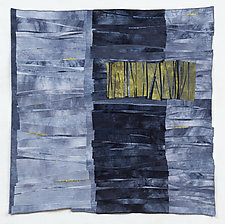 In 1986, a knee injury resulted in time off from dancing and teaching, giving her an opportunity to explore quilt art as a way to meld her love of the visual and performing arts into one.